High bandwidth PCI Express Gen 3 technology provides high performance remote control and bus extension for 5G and DAQ applications. 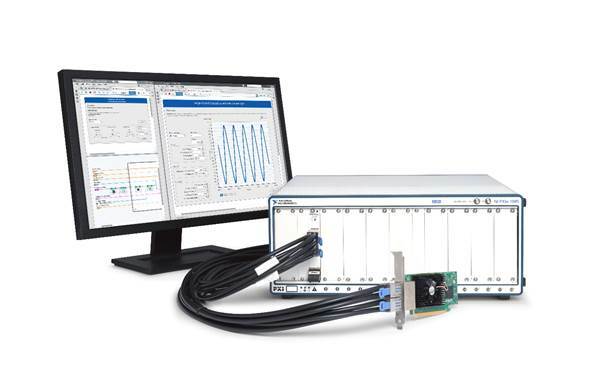 National Instruments (NI) has released a new family of high-performance PXI remote control and bus extension modules with PCI Express Gen 3 connectivity. PCI Express Gen 3 technology delivers increased bandwidth that is critical for data intensive applications like 5G cellular research, RF record and playback, and high-channel-count data acquisition. The PCIe-8398 host interface card communicates over a fully transparent PCI Express Gen 3 x16 link to either the single-port PXIe-8398 or dual-port PXIe-8399 remote control module to offer up to 13.7 GB/s of sustained data throughput. Engineers can use the second port on the PXIe-8399 to daisy chain additional chassis, making it possible to directly interface multiple PXI Express chassis to a single host computer, whether it is a desktop or rack-mount PC. The PXIe-8394 bus extension module supports peer-to-peer streaming up to 6.8 GB/s between chassis-separated instruments with PCI Express Gen 3 connectivity such as the second-generation vector signal transceiver. In addition to multichassis systems, the PXIe-8394 allows high-throughput communication with peripheral devices like RAID data storage arrays or the ATCA-3671 FPGA Module for ATCA. These peripherals typically operate with substantial data sets and can benefit from utilizing the latest PCI Express interfaces. This new family of PXI remote control and bus extension modules complements the already-released PXIe-8880 embedded controller and PXIe-1085 24 GB/s chassis, both of which also feature PCI Express Gen 3 connectivity. This high-bandwidth portfolio of chassis and controllers is an important part of the NI ecosystem that engineers can use to build smarter test systems. These test systems benefit from more than 600 PXI products ranging from DC to mmWave and feature high-throughput data movement using PCI Express bus interfaces and sub-nanosecond synchronization with integrated timing and triggering. Supported by a vibrant ecosystem of partners, add-on IP and applications engineers, the NI platform helps dramatically lower the cost of test, reduce time to market and future-proof testers for tomorrow’s challenging requirements.